The challenges that retailers have faced in the past few years have been nearly biblical in size and scope. • The unstoppable rise of ecommerce, driven by voracious competitor Amazon, has siphoned revenue growth from competitors great and small, and forced every retailer to reassess their vulnerabilities and contingency plans. • Shifts in consumer tastes have left retailers struggling to reposition store footprints that are increasingly at odds with where and how their customers prefer to shop. • Business model innovations, particularly among apparel retailers have forced legacy retailers to rethink historic approaches to sourcing that maximized volume procurement over speed and flexibility. • And for private equity backed retailers, debt burdened capital structures have increasingly come to seem less like savvy aspects of financial engineering than millstones around the necks of companies robbed of the ability to pivot. Perhaps most challenging: during this industry’s (most recent) hundred-year flood, the ominous specter of an emerging consensus has hung like a pall over executives, investors, vendors, and advisors: bankruptcy had become a death sentence for retail, a roach motel with straightforward entrance but no viable way out (at least as a going concern). Recently, the clouds have lifted somewhat. 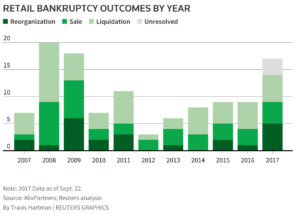 Retailers Toys “R” Us, Payless, and Gymboree are each on a path to successfully emerge from a chapter 11 bankruptcy filing with a substantial percentage of their pre-bankruptcy store count intact. Enlightened self-interest has driven retail stakeholders to reassess their approaches to the challenges inherent in supporting a distressed retailer and better align their tactics with the twin goals of minimizing losses and repositioning struggling retailers for long-term success. As a result, following years of disappointing retail restructurings, stakeholders are more actively supporting a purposeful restructuring process as the best option for a distressed retailer, holding the prospect of considerably higher recoveries than a fire-sale liquidation. The structural challenges facing retail are likely to persist, but with renewed signs of aligned interests among stakeholders, it now appears likely that struggling retailers can navigate a restructuring without the process devolving into a value-destroying liquidation. David Johnson, founder and managing partner of Abraxas Group, has a 20-year track record of driving organizational change. David has served as interim executive or financial advisor to dozens of middle market companies in turnaround and restructuring situations.